In addition to the usual GeoTalk interviews, were we highlight the work and achievements of early career researchers, this month we’ll also introduce one of the (outgoing) Division early career scientist representatives (ECS). The representatives are responsible for ensuring that the voice of EGU ECS membership is heard. From organising short courses during the General Assembly, through to running division blogs and attending regular ECS representative meetings, their tasks in this role are varied. Their work is entirely voluntary and they are all active members of their research community, so we’ll also be touching on their scientific work during the interview. 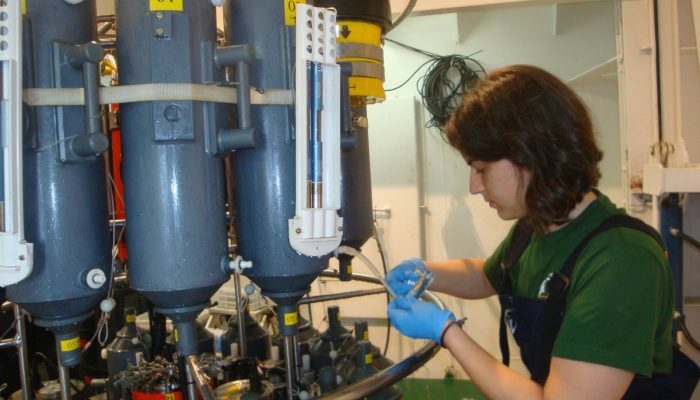 Today we are talking to Maribel García-Ibáñez, ECS representative for the Ocean Sciences (OS) Division. Maribel has been in post for over 18 months, but her term comes to an end at the 2018 General Assembly. If our conversation with her inspires you to get involved with EGU and its activities for early career scientists, then check out what vacancies are available. Hi! As you said, I am Maribel and I am the ECS representative for the OS Division. I come from Spain where I studied the degree of Marine Sciences and later I obtained a PhD in Chemical Oceanography. My research interests are water masses and ocean acidification, especially in the North Atlantic and Arctic regions. Nowadays, I am based in Norway, where I work as a Postdoc at Uni Research. Well, as you mentioned, our main role is to ensure communication between the EGU and their ECS. The way to approach it varies from one division to another. In the OS division, we try to be as active as possible in social media (you can find us on Facebook and Twitter) and we also organise some short courses during the General Assembly. I also communicate with the OS division President, Karen Heywood, to increase the ECS representation within the division. Finally, I participate in the regular Skype meetings with ECS representatives from the other divisions during which we discuss about how to increase the ECS representation in EGU. I attended the General Assembly the year before becoming an ECS representative and I loved its networking environment. However, I felt a bit lost in such a big conference and when I saw the vacancy I thought I could help other newcomers feel more comfortable and welcome. What is your vision for the Ocean Sciences Division ECS community and what do you hope to achieve in the time you hold the position? I think it is a diamond in the rough. I see a lot of potential in networking, but we still need a push to become a more active division in EGU. I must also say that I have already seen an improvement in this aspect during my years as ECS representative, which I hope will continue. My idea when I started as ECS representative for the OS division was to create an active group of ECS ready to push forward the division. However, it has been harder than I thought, but I am positive about the future. What can your ECS Division members expect from the Ocean Sciences Division in the 2018 General Assembly? We have 63 sessions and 3 co-organised short courses: “How to publish in the EGU journal Ocean Science”; “What are the key problems in Climate Science?”; and “Polar science career panel”. I encourage the ECS from the OS Division to attend the Division Meeting during the General Assembly to get to know the division activities and the current division officers. I also recommend participating in the Mentoring Programme to help newcomers to develop new connections (deadline: 31 January 2018) and active participate in the events especially designed for ECS, such as The Early Career Scientists’ Great Debate that next GA will deal with: Should early career scientists use time developing transferrable skills? ; and the short course Academia is not the only route: exploring alternative career options for Earth scientists. And, please, stay tuned to the EGU-OS’s official social media (Facebook and Twitter) and the EGU’s official social media and the EGU website, in particular, the pages dedicated to ECSs, and subscribe to the mailing lists so you do not miss any future activities. Simply check the online resources to get to know what is going on in EGU. All divisions have they arms open to new active members! If you are interested in getting involved in the OS Division, you can contact me via email or social media (Facebook and Twitter). You can also contact the President of Division, Karen Heywood. Also, in 2018, our division is searching for a new ECS representative. If you are interested in the position, apply as a candidate for the OS ECS representative by contacting us through the contact points mentioned above.